And because of him you are in Christ Jesus, who became to us wisdom from God, righteousness and sanctification and redemption. But you were washed, you were sanctified, you were justified in the name of the Lord Jesus Christ and by the Spirit of our God. Even as he chose us in him before the foundation of the world, that we should be holy and blameless before him. CHALLENGE: What other verses remind you that you have been chosen? Add them in the comments below. 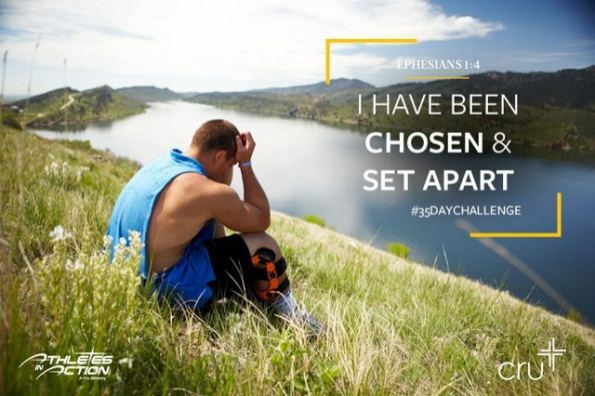 View all 35 promises in the 35-Day Challenge. The final day of our 35-Day Challenge. Day 34 of our 35-Day Challenge. Day 33 of our 35-Day Challenge.